WhatsApp is one of the most popular messaging applications on mobile devices, and it goes hand-in-hand with Viber, Facebook Messenger, etc. WhatsApp was acquired by Facebook a while back, which you’re probably familiar with, but that didn’t stop this app from growing even further. 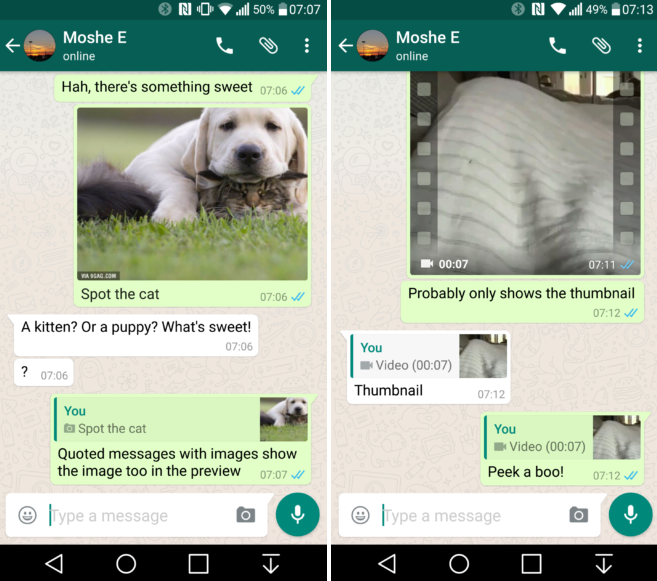 WhatsApp is getting constant updates, and one such update just landed for the beta version of the app, read on. 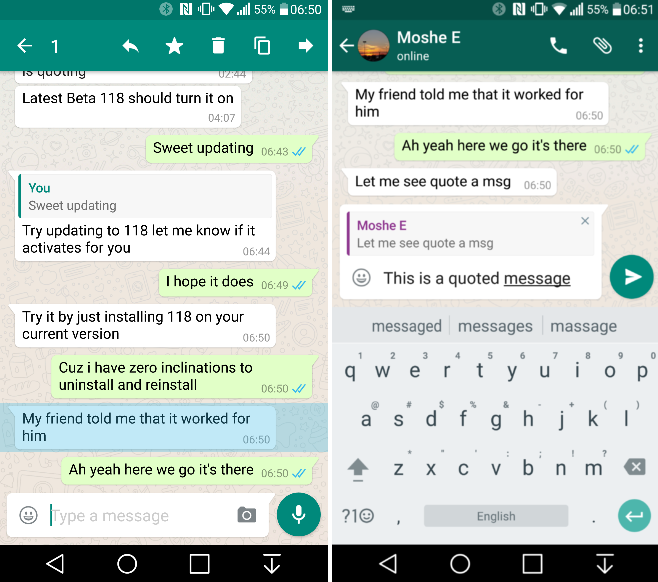 The WhatsApp beta app has been updated to version 2.16.118, and the update brings message quotes and replies, a really interesting feature, especially for a messaging app. Now, do keep in mind that this feature might be rolled out to older versions as well, some users who are on 2.16.116 and 117 have reported that this feature has rolled out to them as well. So, it is possible that the feature is not tied to a single version, but might be a server-side switch. That being said, this feature is kind of self-explanatory, you’ll basically going to be able to reply to quote the messages you reply to. All you need to do is select a message you’d like to reply to, and you’ll see a reply button pop up, hit that and type in your reply. After you’re done with all that, simply send the message, and voila, your message will be sent along with the message you replied to, which will be quoted, of course. Now, this option works for whatever content you’d like to reply to, be it text, picture or video, it really doesn’t matter, you can quote anything. That being said, you can use this feature for any message that is sent your way, no matter if it’s in a private chat or a group chat. All of these features are available in version 2.16.118 of the app and it can be downloaded from APK Mirror or you can join their Play Store beta program or to manually download the APK from APK Mirror .